Maria Victoria Henao; Former Wife of Pablo Escobar, is she Married to someone Now? Maria Victoria Henao, the former wife of the most wanted criminal, Pablo Escobar is still unmarried after the death of her husband. The lesser known and not so popular wife of the most narcoterrorist Pablo Escobar, Maria Victoria Henao always kept herself far from the limelight, mostly because of the family name she carried and all the illegal things that her husband did. But she never left her husband despite several criminal acts and numerous extramarital affairs only for the sake of her children. Maria faced many problems during Pablo’s lifetime had to face another pile of problems after the death of Pablo. So, what is she up to nowadays? What about her children? Are they still living in Columbia without any issues or hiding somewhere in the continent? Let's find out! Maria Victoria Henao; Former Wife Of Durg Lord Pablo Escobar; How Was The Relationship With Her Husband? Maria’s brother, Mario was included in drug trafficking in a small scale enterprise along with her husband, Pablo back in those days when he was not known as The Drug Lord. During that time, the couple met for the first time and eventually started falling for one another. Moreover, Maria’s family were strictly against them due to their huge age differences but still the pair dated without the approval of their family. Finally, the day came when for eternity, so they got married in 1976. Despite their age differences, as Maria was 15 and Pablo was 26, the couple came together to start their new life. Furthermore, they started living happily in spite several obstacles. Pablo cheated so many times on his wife and had extra affairs, but despite that, she was committed to him for the life which shows a deep love towards each other. Years after getting married, they welcomed their first child in 1977 and named him Juan Pablo. Similarly, after the birth of their first child, the couple also invited their second baby in 1984 and named her Manuela Pablo. Moreover, the children along with their mother changed their name to Sebastian Marroquin, Juana Manuela Marroquin Santos, and Victoria Henao Vallejos after the death of Pablo. Pablo was encountered on 2 December 1993 by the Columbian Police after escaping from La Catedral. They changed their name after the death of Pablo to be safe and secure. Before the death of Pablo, Maria never left him even if he cheated numerous times on her. She bore all the pain only for her children and her love. But after the death of Pablo, they had to face numerous controversies and rumors, so they started living a low profile life in Argentina by hiding their identity. Love is unexplainable. While Pablo was of one of the most hated people in the world for his family he was a hero. For his wife, he was a gentleman. Though the whole world breathe a sigh of relief after the death of Escobar, there was one family who was completely shattered. After the death of Pablo, Maria along with her children went through a tough time moving on with their lives. Due to the bad reputation, the family had to suffer a lot. The Colombian government sealed all of their money. They were also not accepted by the country because of the criminal records of Pablo. The family had to stay as a refugee in different countries as many countries refused to make them their citizen. Moreover, after such humiliation and devastating situation, the family moved to Argentina and started living a low profile life in a flat by changing their names and identity. But in 1990 Henao and her son Juan Pablo were arrested for money laundering and imprisoned in Argentina for many months. After the release, she told the media that she was arrested because of his past life. As of now, the family is living a better life but is staying far from the limelight and media. They are hiding from the world to be free from any controversies. Maria is currently single and not married to anyone. We wish this family best wishes for their future endeavors. Born in 1961 in Columbia, the United States. Raised along with her brother, Marios who was also included in the criminal activities along with Pablo. Got married at the age of 15. 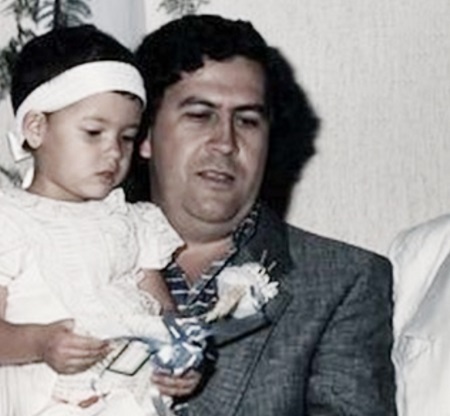 Born as Pablo Emilio Escobar Gaviria on 1st December 1949 in Rionegro, Columbia. Son of Abel de Jesus Dari Escobar and Hermilda Gaviria. Was the third child among seven of his siblings. Attended The Universidad Autonoma Latinoamericana of Medellin but was dropped out soon. Involved in many criminal activities and used to earn money from those activities. Used to smuggle tons of cocaine per day worth billion. On 2nd December 1993 was encountered by Colombian National Police and died after escaping from La Catedral. Has estimated net worth of $30 billion. There is a TV series entitled Narcos based on his life which first episode aired on August 28, 2015 as a Netflix exclusive.